Mitt Romney, the supposedly "intelligent business man," said something yesterday that may be one of the stupidest things to ever come out of his mouth. And I'm not talking about the 47% comment; I'm talking about his comment that Obama wants to redistribute wealth, while he wants to create it. I've blogged about this before, but I think it needs to be hammered home, wealth is not a commodity. It is not like Cadillacs or Yachts that can have production increased and flood the market. Wealth, while not a finite resource in strict terms, does not actually increase over the long term. It may grow in limited windows, but over time, it will normalize to proportional levels. What this means is that inflation will overtake gains every time. A few decades ago, a millionaire was the pinnacle of wealth, now millionaires are a dime a dozen. In today's world, the billionaire occupies the same lofty status as the millionaire did in 1900, and they probably represent the same proportion of society, after adjusted for population growth. This does not mean that an individual cannot attain vast social and financial mobility, both in the positive or the negative direction. What it does mean though is that, in our current economic model, there will be roughly the same proportion of very wealthy people to the rest of society, and there will always be a poor underclass, at, again, roughly the same percentage as exists today. This is simple economic fact. Pumping more money into the system ultimately will only spur inflation, it will not increase the number of wealthy people, nor will it decrease the number of people living in poverty. Therefore, the only way to change the percentages and proportions of rich and poor is to redistribute wealth. 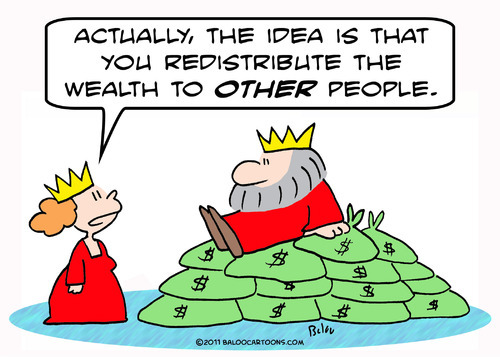 Redistribution moves money around the in system, altering the relative proportions of the people in each category. The Bush years saw one of the largest redistributions of wealth seen in this country since the Gilded Age, which was the last time that the rich controlled a similar share of the nations wealth. That was also the last time the net worth gap between the rich and the poor was at this level of disparity. Understand, this was not caused by creating wealth at the top, it was created by redistributing money upward, taking it out of the pockets of those with the least, and giving it to those with the most. It has been a case of trickle up economics. And this is where the "business man" shows that he knows very little about how economics work. It harkens back to his comment about "making this a country of haves and soon to haves." He acts like all Americans can be rich at the same time. This is not possible in a capitalist society. The only way change this ratio is to redistribute wealth from the rich to the poor. This disaggregates money, spreading it around, and reducing the gap between the ends of the spectrum. Many of our Social Safety Net programs do this. Unemployment is one of the best examples of a redistribution program in this country. Businesses, who typically have some amount of liquid assets, pay into the unemployment insurance fund, which then gets spread around to the unemployed, keeping them from falling further down the social ladder. Other redistribution programs include subsidized student loans, Pell Grants, The Earned Income Credit and many other programs that allow people to maintain their place society, and even improve their lot in life. These essential programs are funded by income taxes on the wealthy, and move money into the hands of those who need a hand up or steadying support in life. These programs help equalize society, but they are, by strict definition, somewhat socialist. They are not, however, hallmarks of dependency. They are not a "hammock" for lazy people to lie down in and have the world handed to them. This redistribution makes society stronger, because it does open doors for everyone to have the possibility to become rich. If you become homeless because you lost your job, finding another while in that situation can be almost impossible. Unemployment supports people so that they don't fall so far that they can't recover. Student loans and grants allow anyone to go to college, and as a result, dramatically increase their lifetime learning potential. Earned Income Credits allow people with families who also have jobs, try to get a little bit ahead in life, to provide more for their children, and maybe make their lives better. These downward "redistributions" make society stronger, and give more people opportunities to improve their lives. And this is the dirty little secret that Mitt Romney does not want to admit, if he wants this country to be a place where everyone can be rich, he will have to end capitalism as we know it, and replace it with egalitarian communism. It's kind of a strange position for the Republican presidential candidate to be advocating.